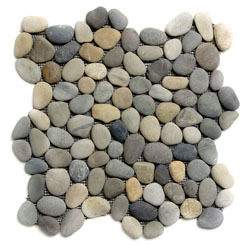 These beautiful stones are available with a natural surface or with a glazed finish. Sheets are curved on all four sides, allowing them to fit together to produce a seamless surface area. Sheet size is approximately 1 square foot. Small swatches cannot fully represent the beauty and diversity of natural stone; please order a full sheet if you would like a sample. Please note: Computer monitors vary in how they show color. Photographic lighting can also affect the look of tile. We strongly recommend ordering a sample sheet before placing an order.